We investigate fundamental phenomena related to the interaction of fast-rising magnetic fields with nearly-collisionless plasma, including particle acceleration, the problem of magnetic energy dissipation, penetration of magnetic field into plasma and the seeming deviation from the frozen-in-law, plasma resistivity, and instabilities. These phenomena are often encountered in research towards thermonuclear fusion, space physics, and radiation generation. The phenomenon of magnetic-field penetration into highly collisional plasma by diffusion is well known from early studies in plasma physics. However, in the mid 80’s, a group at NRL reported on measurements which indicated fast magnetic-field penetration also into collisionless plasma . Over a decade after the first measurement at NRL, the WIS Plasma Group has begun performing comprehensive spectroscopic measurements on similar systems. 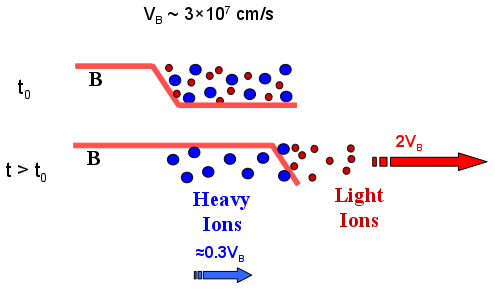 The experimental platform, described schematically in the figure below, is based on a system of pulsed currents driven through a plasma bridge between two electrodes (similar to a configuration known as plasma opening switch). Due to the plasma high conductivity, the current begins to flow through the plasma edge and generates the magnetic field. The diagnostics are performed by temporally and spatially-resolved spectroscopy. A major challenge in spectroscopy is obtaining the spatial resolution along the line-of-sight. We achieve 3D spatial resolution by the injection of trace-elements into the plasma . The magnetic field propagation seems to be independent of the direction of the current flow with respect to the electron density gradient (in contradiction with available Hall-field theory) . Our present research focuses on explaining these results, based on new experimental techniques and data-analysis approach that achieve significantly improved spatial-resolutions.